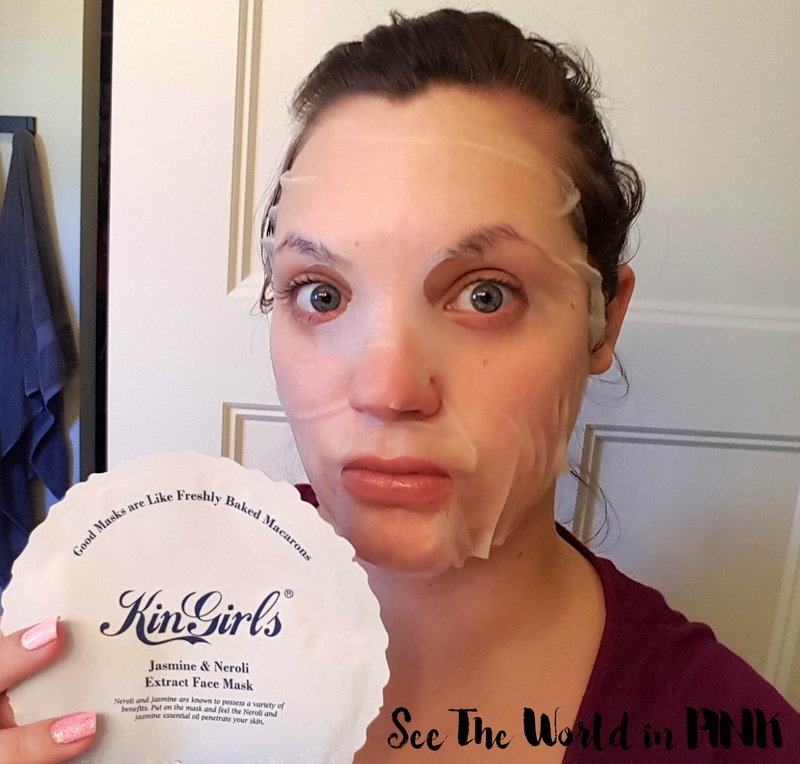 Mask Wednesday - KinGirls Mask Reviews + $5 Off Coupon Code At Beautibi! Happy Mask Wednesday! I was super excited to be selected to participate in the Beautibi Blogger panel and get to review a couple of Taiwanese mask brands that are new to North America! Last week I reviewed a few masks from the brand Unitouch - you can check out the post here! 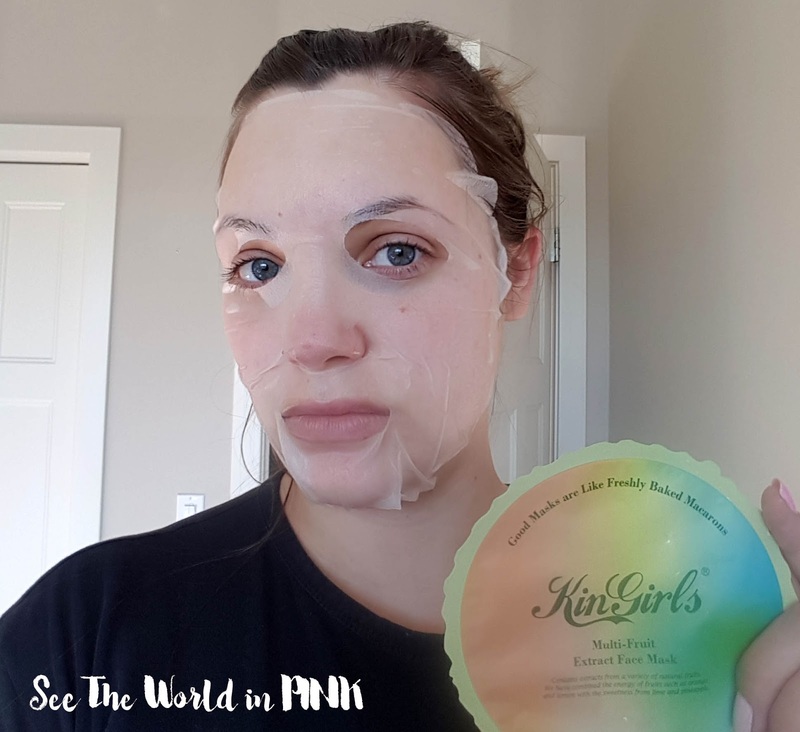 This week I am reviewing masks from the brand KinGirls! 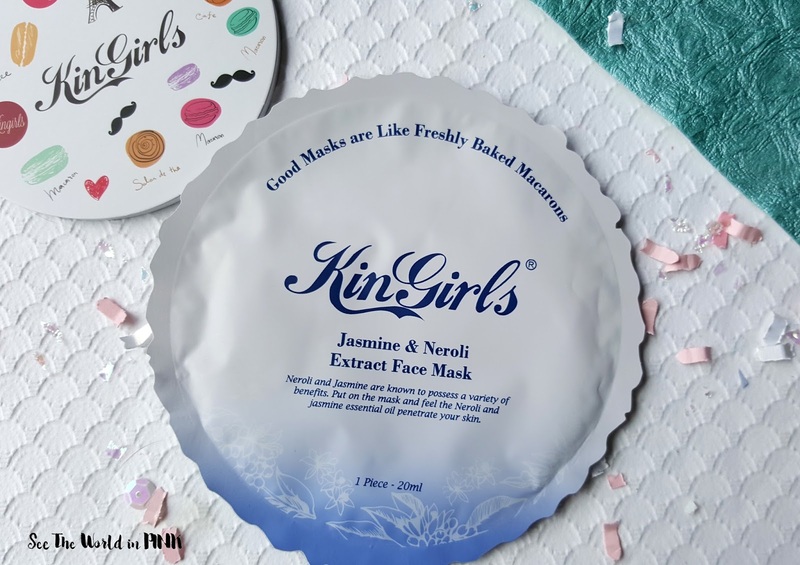 KinGirls is a Taiwanese brand whose motto is "good masks are like freshly baked macarons". I happen to love macarons, so I am looking forward to trying these! 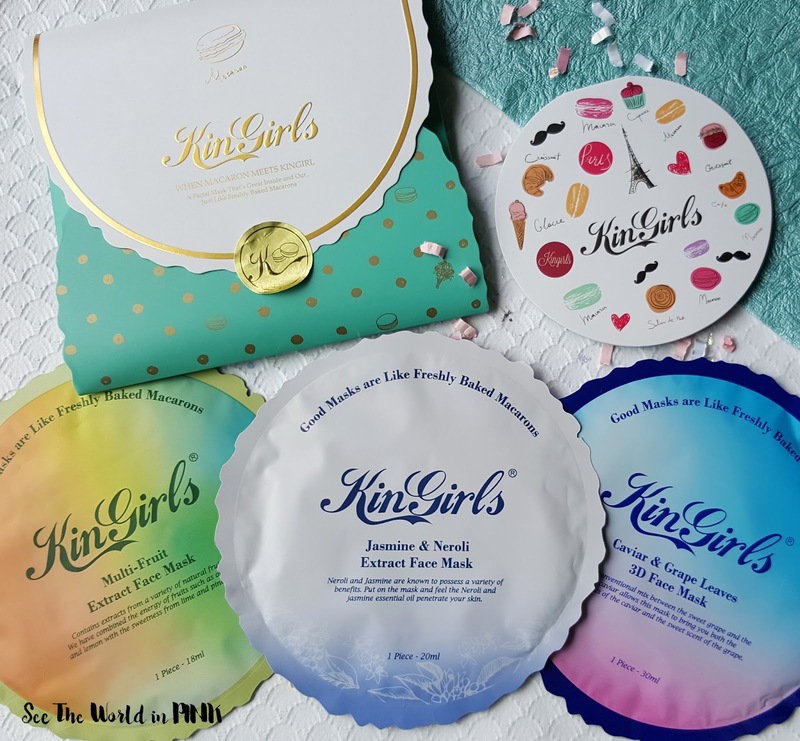 KinGirls compares itself to the macaron - they strive for perfection and they make masks that are an essential part of a complete skincare routine. There are no parabens or other chemicals in the masks and they are hypoallergenic and made for sensitive skin! 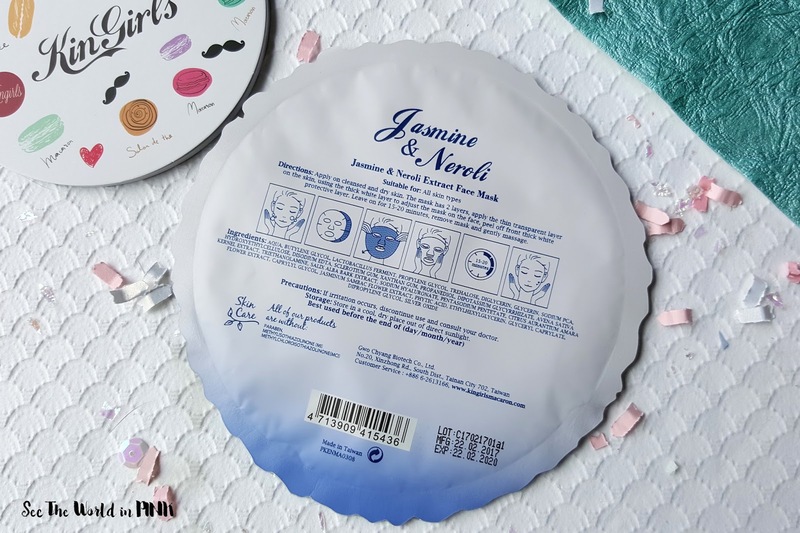 KinGirls Jasmine and Neroli Extract Face Mask ~ $6.00. A girl in deep thought is as focused as a mysterious blue garden. A fresh and healthy basic moisturizing model, this facial masks provides the skin with a highly moisturizing effect, giving soft and supple skin after usage. This masks star ingredients are bitter orange flower extract and jasmine flower extract, plus the ingredient list includes multiple flower and fruit extracts as well. These are all beneficial to moisturizing the skin. This mask is straight forward to use - wash face, tone skin, apply mask, leave on for 15-20 minutes, pat remaining essence in to skin, and complete skin care routine (those with oily skin may rinse off the essence prior to completing your skincare routine). This mask came with a ton of essence in the package and the mask was well soaked in essence. The masks itself was a comfortable, very thin material and it adhered to the skin well! This mask lasted about 20 minutes on me before all the essence was absorbed in to the skin. This made my skin feel pretty good - my face was very soft after using this, but not as moisturized as I was hoping for! I do have dry skin so I need lots of hydration - I think this would be great for combination/oily skin! 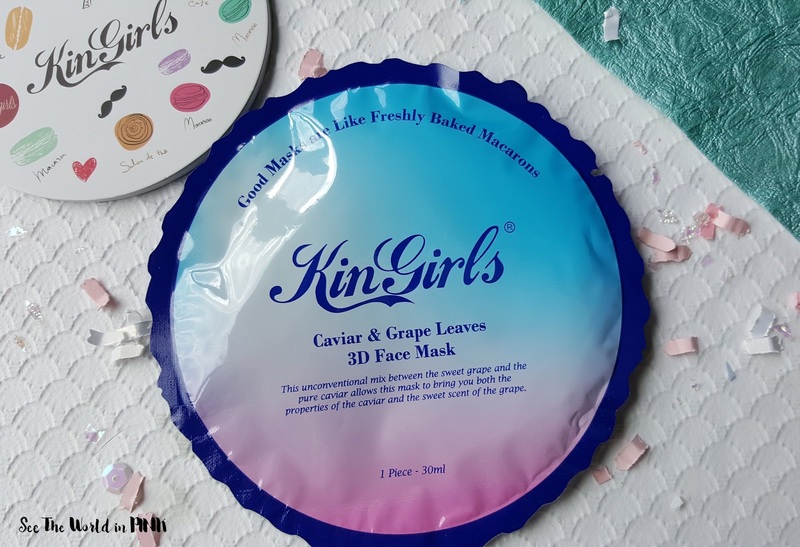 KinGirls Caviar and Grape Leaves 3D Face Mask ~ $6.00. Believe that your smile is the most beautiful and confident makeup. This unconventional mix between sweet grape and pure caviar allows this mask to bring you both the properties of caviar and the sweet scent of the grape. Caviar essence replenishes necessary nutrients. Combined with caviar essence and grape leaf extract, this mask will balance and nourish your skin, leaving you with a hydrated and glowing complexion. I love that this is a 3D mask - instead of just fitting on the face, 3D masks include a mask piece under the chin that usually hooks around the ears. This offers the skin a lifting effect as well! This mask is easy to use - wash face and tone skin, apply mask making sure to hook around the ears, wear for 15-20 minutes, remove mask and pat remaining essence in to skin, and complete skincare routine. This mask was a thicker material than the previous KinGirls mask - I preferred the softness of the thinner mask, but this one still felt great to wear! I liked how well this fit my face and it had a lot of essence so it adhered well! This did have a gentle grape scent but nothing overwhelming. This also had a creamy essence and lasted about 30 minutes on my face. My skin did look look brighter and felt smoother after wearing this! 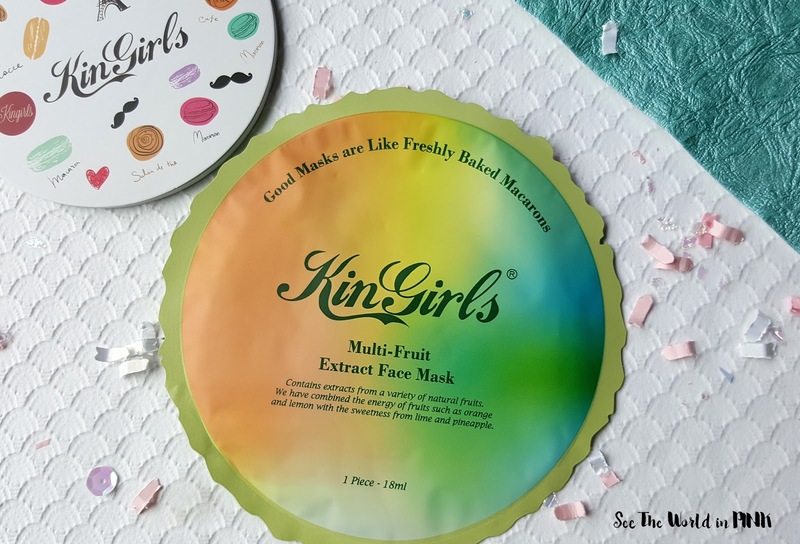 KinGirls Multi-Fruit Extract Face Mask ~ $6.00. Comprehensive fruits (grape seed, lemon, apple). Containing essence from a variety of natural fruits, this facial mask replenishes nutrients that the skin needs, balancing and nourishing the skin, giving you translucent and resilient skin after usage. 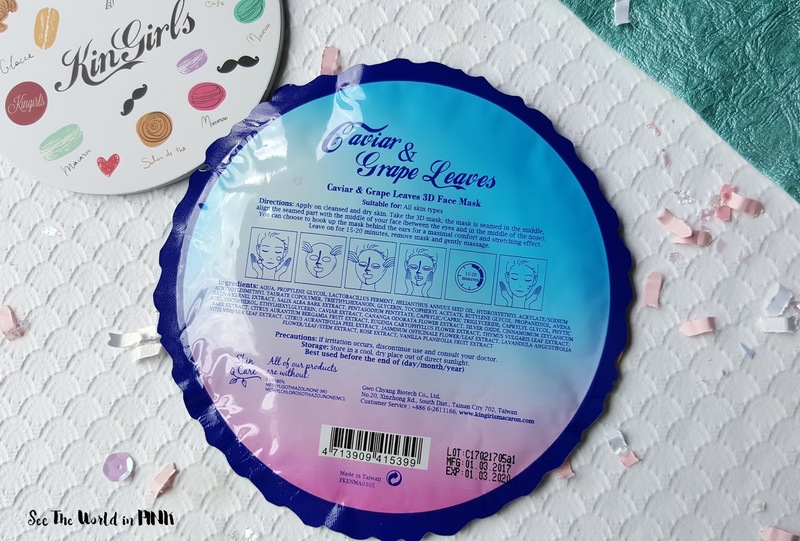 I have to say I love the packaging of these masks - they certainly are aiming to look like a macaron and even have detailing along the edge of the package! I like fruit masks - I find they generally work well on my skin! 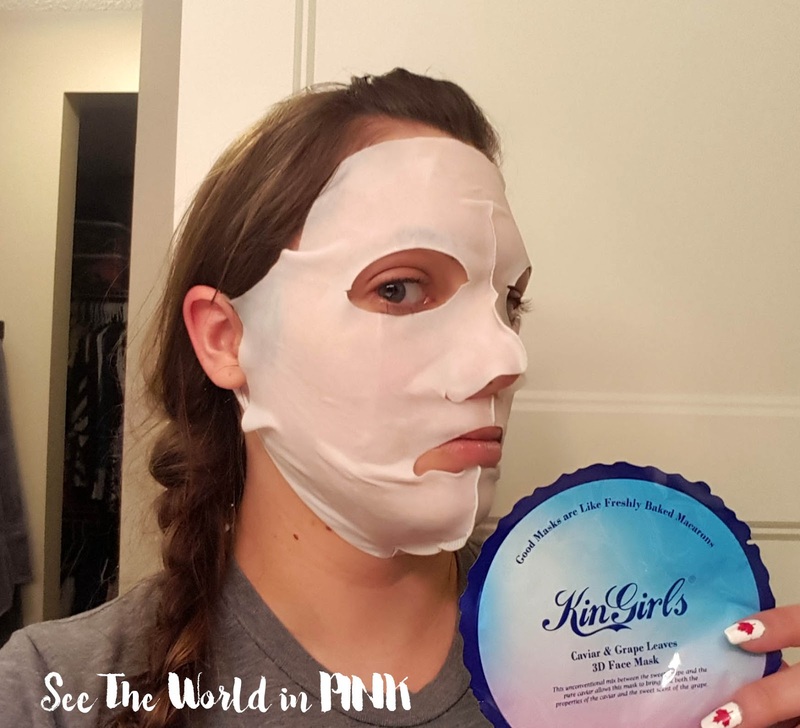 This mask is used just as the previous KinGirls masks - wash face, tone skin, apply mask, wear for 15-20 minutes, remove mask, pat remaining essence in to skin, and complete skincare routine. Again, if you are oily you can rinse the remaining essence off with water prior to completing your routine. This mask was fairly similar to the Jasmine mask in terms of amount of essence, adherence to the skin, fit, length of wear time, etc. But I preferred the essence of this fruit mask. It left the skin feeling really soft and moisturized after wearing, plus my skintone looked more even and brighter! 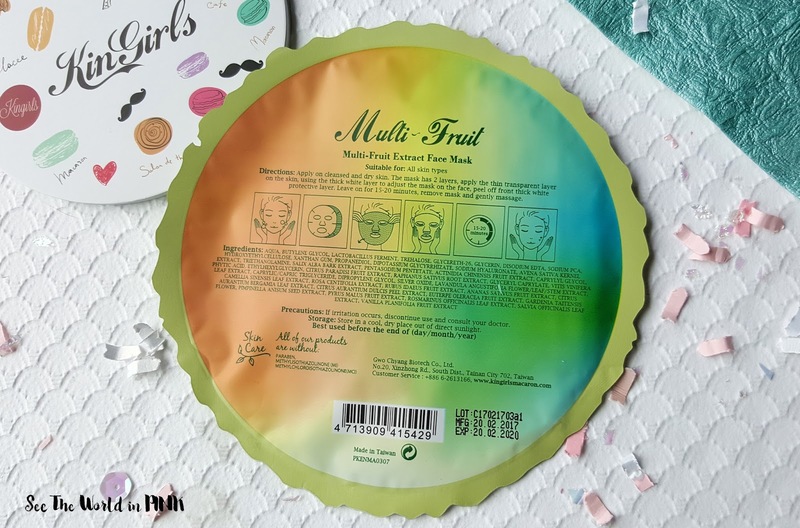 I love how cute the KinGirls masks are and I really enjoyed the Multi-Fruit mask and especially the 3D Caviar mask - that was by far my favorite! Have you tried KinGirls before? If you haven't and are interested, head over to Beautibi and pick some up - they have a ton of other great mask brands as well!